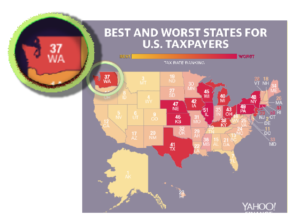 Life magazine has rated WA state as among the 13th worst for tax burden. This puts the Evergreen States in a basket with Kansas, New York, Massachusetts and Texas. We come just one notch WORSE then Mississippi! The ranking included real estate tax, vehicle property tax, income tax, and sales and excise tax. Being a homeowner in New Jersey isn’t cheap at all — in fact, NJ residents see the highest effective real-estate tax (otherwise known as property tax) rate in the country, at 8.13%. Trailing behind are Illinois (7.71%), New Hampshire (7.33%), Connecticut (6.89%), and Wisconsin (6.47%). WalletHub, the company doing the analysis, calculated these rates by dividing the effective median real estate tax in that state to the median income.